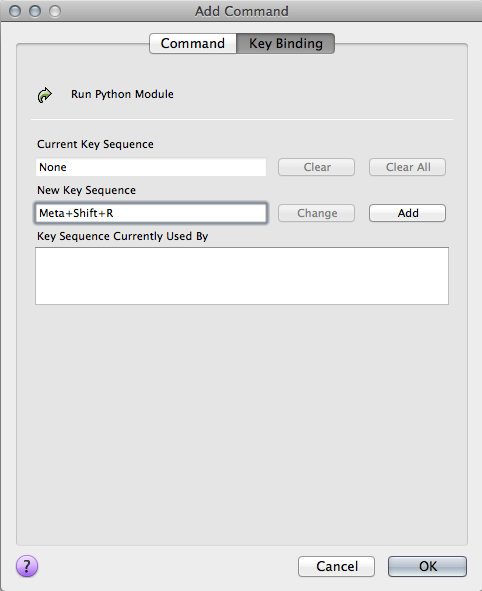 Although multiple versions of Python are available, we require that everyone use the exact same version version of Python for their CS1110 work. You are free to either work in the ACCEL labs or to use your laptop; but whatever the case, your version of Python must be the same as what we are using in the labs. Hence, even if you already have Python installed on your computer, we ask that you install a new version (see instructions below) so you can be consistent with everyone else. If you have problems, and if you have a laptop, the best thing to do is to bring it in to someone to look at. Any of the course staff or consultants can help you with this. If you cannot bring in your computer, we have provided you with some instructions below. <qj34@cornell.edu>. The version of Python that we are using for this class is only compatible with Vista, Windows 7, and (we believe) Windows 8. 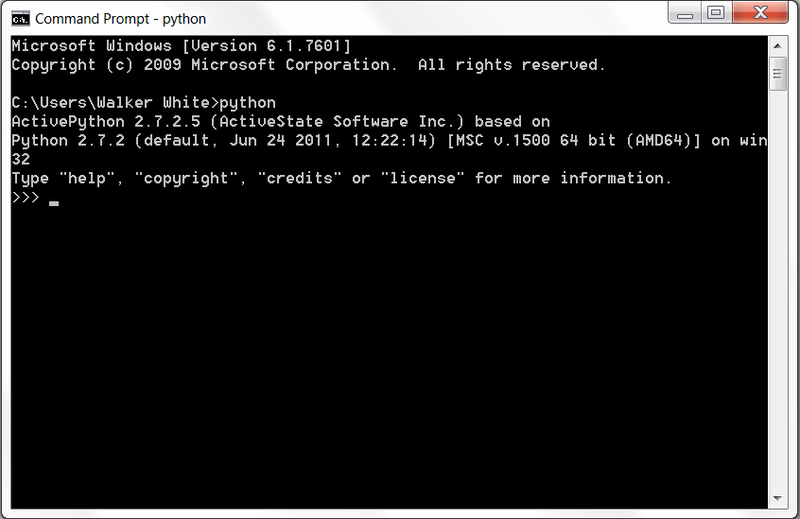 If you are using Windows XP, you will not be able to use this version of Python. In that case you will either need to upgrade your OS or work in the ACCEL lab. 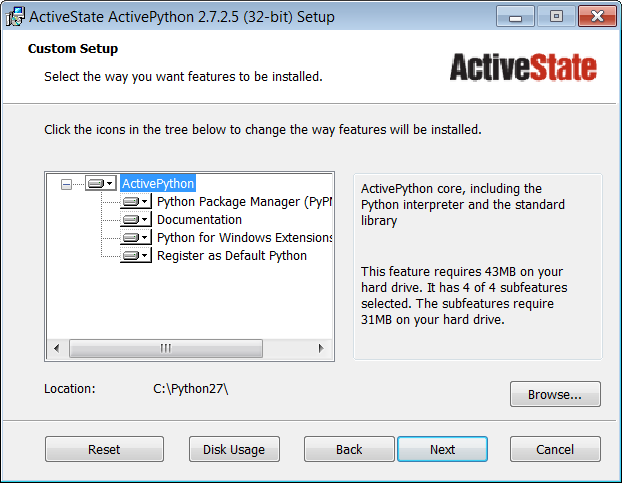 Go to the ActiveState web page and download the free 32 bit Community Edition of Python 2.7.2. This should be the first big blue button on the right. Do not download the 64 bit version, even if you are using a 64 bit version of Windows. Some of our extensions do not play well with 64 bit Python. In addition, make sure you have Python 2.7.2 or other version starting with 2.7, and not Python 3.2.2. or any other number starting with a 3. Python 3 is "bleeding-edge" software and too new to safely use in this course (particularly because it is not backwards compatible with Python 2.7). When you download this file, you may get a web page asking you to fill in some information. Ignore this web page. You do not need to fill in the information; your download has started already. Although OS X ships with an older Python by default, we do not want to use the Apple version of Python — but we do not want to delete it either (deleting System software is always a bad idea). So we need to change some settings to make sure that you will always use the correct version of Python for this class. Before you do anything at all, we recommend that you quickly familiarize yourself with the Terminal program. You do not need to master the commands yet. Just learn where the program is in your Applications folder (and put it in your Dock), and how to start it. Go to the ActiveState web page and download the free Community Edition of Python 2.7.2 (or other number starting with 2.7). This should be the big blue button on the right. Make sure you have Python 2.7.2 and not Python 3.2.2 (or any other number starting with 3). Python 3 is “bleeding-edge” software and too new to safely use in this course (particularly because it is not backwards compatible with Python 2.7). If there is enough interest, we will look into this possibility. If you want Python on Linux, contact TA Qin Jia <qj34@cornell.edu>. Get the installer: download the installer from Active State's website (click on the blue "Download Komodo Edit" button after you follow that link). Do not download Komodo IDE, as that is the paid version. Again, you will be redirected to a website asking for some personal information; ignore that and wait for the download to finish. The file that you download will either be a MSI installer for Windows or a DMG for Macintosh. Double click on it and follow directions. 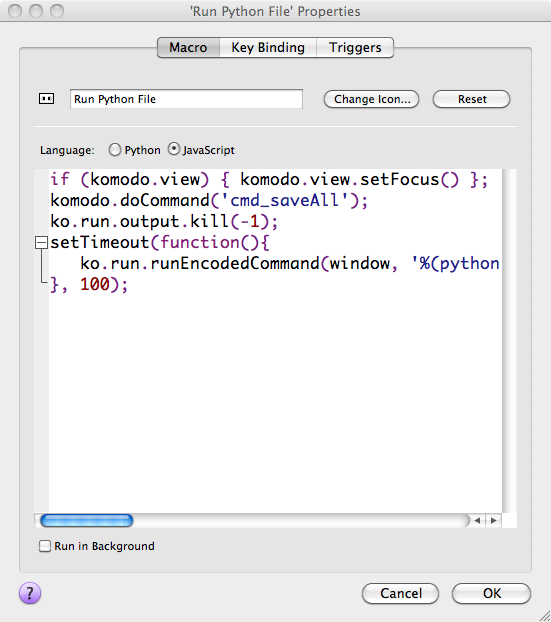 On Macs, make sure Komodo Edit runs the CS1110-approved version of Python: Open Komodo Edit and then select the Preferences menu option (under Edit on Windows; under Komodo on Macintosh). 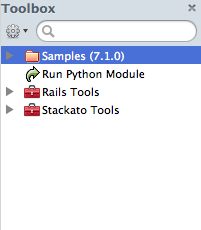 Click on the Languages category in the left-hand “sidebar”, and then the Python (not Python 3) subcategory. In the main pane that should appear, where it says "Default Python Interpreter" and underneath that "use this interpreter", change that to (hopefully it'll be in the pulldown menu, otherwise one should use the "browse" option) /usr/local/bin/python . You will get a box pop up that defines the macro. 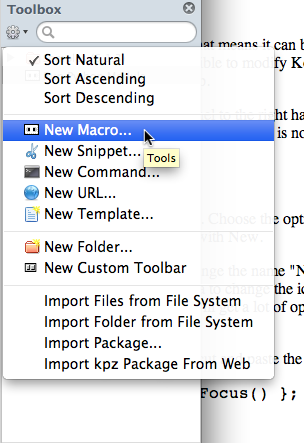 Change the name "New Macro" to the command "Run Python File". It is also a good idea to change the icon. We personally like to use an arrow. If you click on "Change Icon", you will get a lot of options to chose from. Our icon is called the "redo" icon in the provided icon set. Another option that is quite useful to set is to have a guideline (grey vertical line) showing you where 80 characters in is, so you can tell if your lines are too long and need to be split. Click on Editor, and then Smart Editing, and select the checkbox that says “Draw the edge line column”. Put 80 in for the Edge line column. If you do so, then you'll see something like this when you write code. Note how the author of this code could see that they needed to hit return after the word “calls” in line 13.